I've been doing lots and lots of preparatory drawings for the next book, Crogan's March (I'll probably refer to it as "March" in shorthand), and I figured I'd post a few. These are for the Tuareg camp. 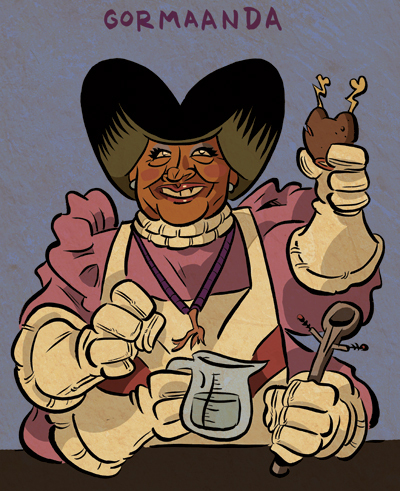 Also, Atlanta cartoonist Justin Wagner's website is up and running, and he has some great sketches up on his blog. 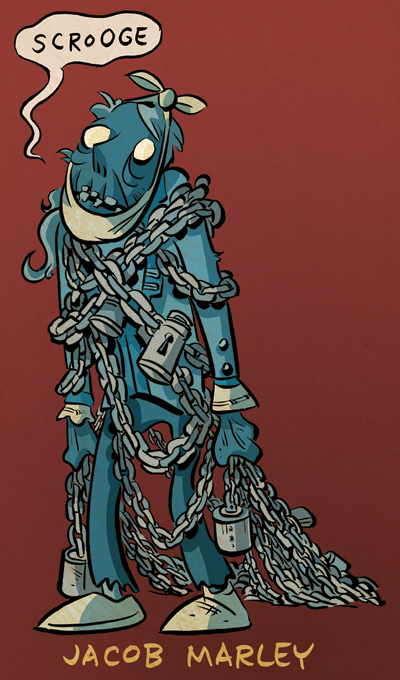 You should check it out; he's one of those guys that straddles animation and comics, and does does both well. 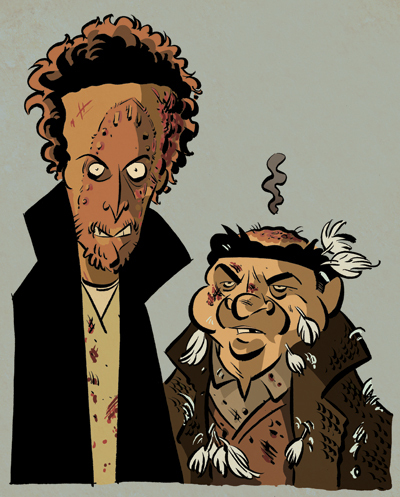 You know, drawing these guys, I just cringed. Ouch! I was going to draw the old man, but I don't have the DVD and google image search wasn't particularly helpful. 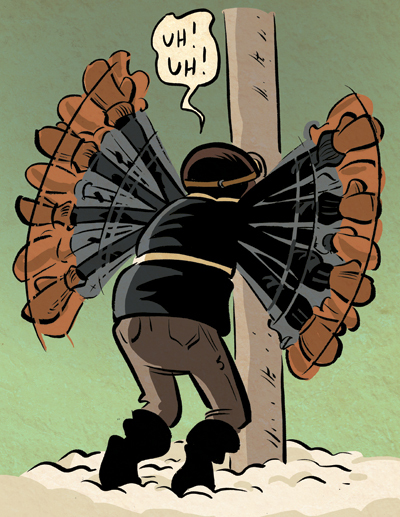 I'm kid of glad - figuring how to work the iron scar in with flat colors was challenge. Well, that's it! Have a Merry Christmas, everyone! Hohoho! 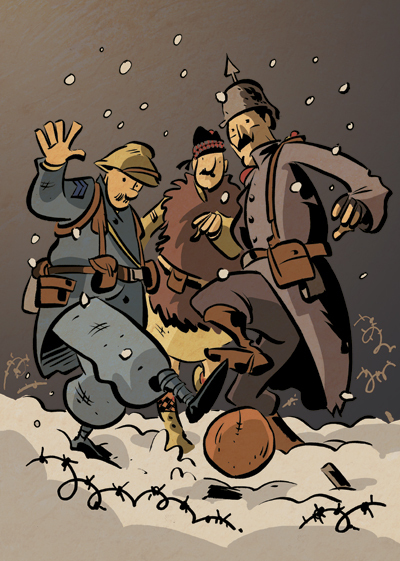 For the next-to-last Christmas drawing, here's a Hun, a Frog, and a Limey having a soccer game in no-man's land during the famous Christmas Eve cease-fire of 1914. 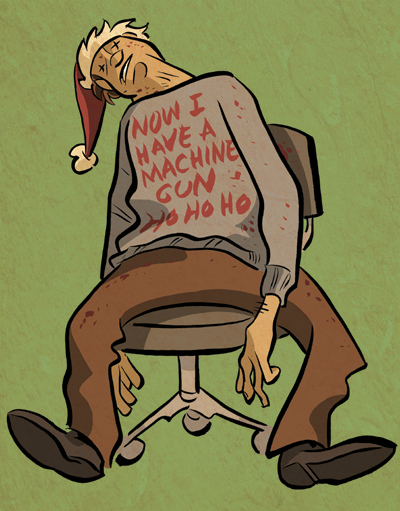 Here's an X-Mas image bristling with holiday terror - Santa! 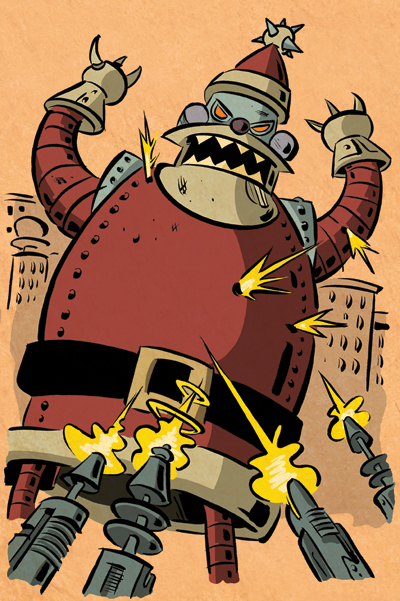 In case you haven't seen the Futurama Christmas episodes, Santa is a murderous robot who judges everyone to be on the naughty list and thus destroys anyone he sees out on X-Mas eve. Also, I realize too late that my title numbering system was off - I should have started with T minus ELEVEN, because as it stands Christmas will still be one off from the theoretical Christmas blastoff. Curse you, advanced arithmetic! The Christmas Story holds a special place in my heart, for reasons beyond its exceptional comedic quality. From the time I can remember, my parents and all of their friends would hold a Christmas Story party each year, where everyone would come dressed as a character from the film. The first couple of years were standard - Randy who can't put his arms down, Scott Farkus, stuff like that - but as the years went on, and no one wanted to be repetitive, the costumes became more nuanced and obscure - the Christmas Tree Salesman, the teacher in paper-grading regalia, the lamp, the old man knee deep in Bumpus hounds, dead Black Bart... it was tons of fun for me and my sister to see, as a kid, these adults going all out to make a big evening of it. We moved to Kentucky when I was eleven, but the Lousiana folks STILL have the Christmas story party each year. Gosh, it's coming up on twenty-five years, I'd bet! Liz and I were lucky enough to live a couple of hours away when we ran the hotel, and made it up for it. So while I've heard griping of TBS's annual 24 hour marathon, I couldn't be happier with it - each scene in that movie is the funniest scene, and its as much a part of Christmas to me as opening presents. 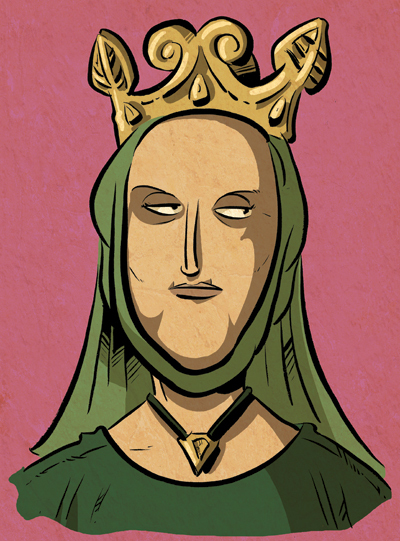 A sort of composite likeness based on existing period depictions. She had been a crusader, queen of two countries, and a cunning political mind before being locked away by her second husband, Henry II, to keep her from stirring up any more civil wars. I picked her as a Christmas character because of Goldman's excellent play The Lion in Winter, which is about Henry bringing his family (Eleanor and surviving sons Richard, Geoffrey, and John) home for the holidays to play mind games and ostensibly decide on a successor. The play was made into two very, VERY good films, one starring Katherine Hepburn as Eleanor and Peter O'Toole as Hal II, and the other with Glen Close as Eleanor and Patrick Stewart as the vengeful hubby. When compared, both films have their strengths and weaknesses - in the 60's version, Hepburn plays Eleanor as increasingly desperate in a way that Close seems to try and mask; Patrick Stewart, with the same lines, is a far more magnanimous Henry. O'Toole seems downright cruel and diabolical; Stewart says everything with a smile and you can't help but like him even when his behavior is contemptible. In fact, that's a good way to look at the films as a whole: the dialogue is the same in both, but everything uttered in the sixties version is hard-walled contempt, and everything in the 2003 version seems to be good-natured ribbing. As a medieval political movie, the former works best; as a home-for-the-holidays movie, the Stewart/Close version wins out. I don't care for the performance of John in the older movie, and I don't like the performance of Richard in the new one. Both, though, are worth watching - give 'em a queing in your netflix cycle. 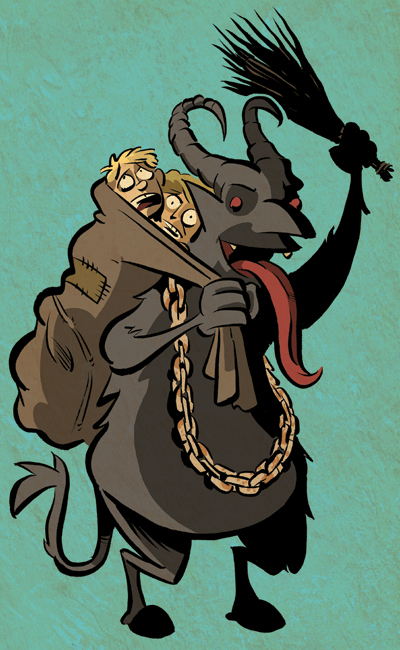 Twelve Days of Christmas T-6: Krampus! The Krampus is Saint Nicholas's dastardly sidekick. He takes your toys if you're bad, womps merrymakers with a birch twig club, and carries naughty children away to work forced labor at the North Pole. I for one am upset that he doesn't see more play in the good ol' U.S. of A.
I originally did a more realistic, less Schultz-design-oriented Mr. Van Pelt, which I based on the Phillip North-Beardsley kid from the old Lucy/Henry Fonda Yours, Mine, and Ours film, because I was, for years, convinced that the kid was the voice of Linus. Turns out I was wrong (not WAY wrong - turns out it was that kid's little brother), but I always envisioned real-life-counterpart Linus as being that kid. 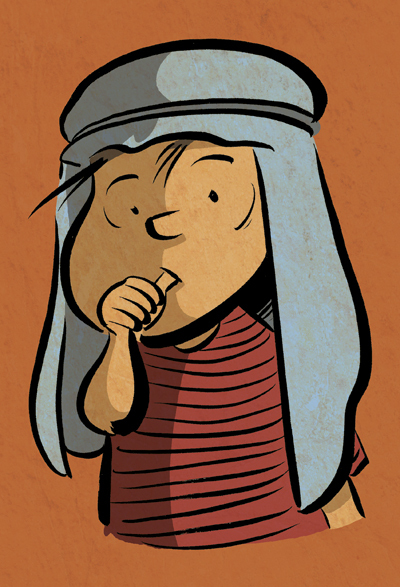 But it looked weird to have a non-Schultz design, and I thought the Peanuts purists might call for my blood. So here's the traditional Christmas Linus. If you haven't watched the special yet this year, shame on you. It's tradition. Twelve Days of Christmas T-8: Gormaanda! It wouldn't be the holidays without Gormaanda. Come out to the coast, we'll get together, have a few laughs. I haven't seen this movie in forever (I don't have it on DVD, only VHS) and so the depiction is from memory. If there are details wrong, chalk it up to interpretive recollection. 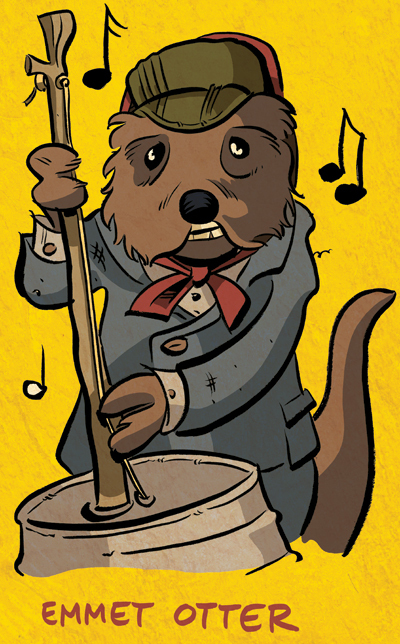 The second drawing is of ol' Balthazar! 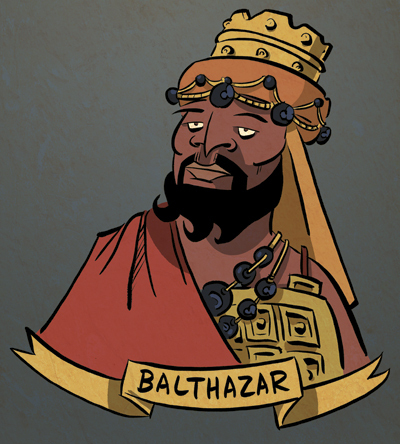 Balthazar, one of the three kings, possibly a Zoroastrian, immortalized in the brilliant Franco Zeffirelli movie Jesus of Nazareth by James Earl Jones, and played with regularity throughout my childhood by my dad in the opera Amahl and the Night Visitors. It's a great bass part, and I had the opportunity to play Amahl alongside him when I was about eleven. Twelve Days of Christmas: T-12 and counting! Yeah, yeah, I know, the twelve days of Christmas come AFTER Christmas, but so what? Our culture has firmly embedded the idea of the countdown into my psyche, and for me Christmas spirit is usually sapped by noon of the 25th, so therefore I am starting on the thirteenth and working my way to the big day itself. 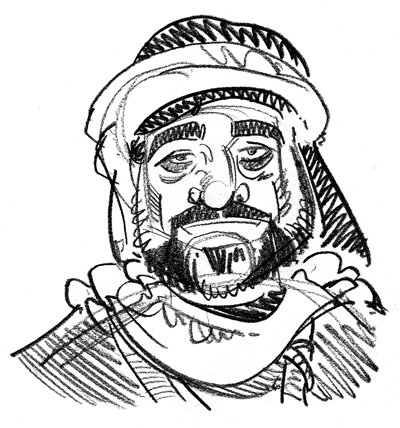 Each day for the next twelve, I'll be posting a drawing of a holiday character. Some may be obscure, some may be heavily popularized, but all will be drenching with yuletide cheer! In other news, the signings went very well, the break from classes is going nicely, and the missus and I went to go see the Terra Cotta Army of Chin Shi Huang at the museum today for my b-day, which was AMAZING. And those "life-size" reproductions you see? A big ripoff. For one, the figures are mostly whiteish-green (they're usually depicted reddish brown, black and brown), and for another they're almost all well over six feet tall, and quite a few were taller than me. All the repros I've seen are five feet at most. Just so you know!